DC Superhero Girls is an action figure franchise which places various of DC’s heroes during their high school days. DC had several tie ins including Lego and a range of books. 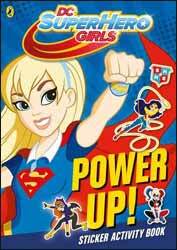 The DC Superhero Girls: Power Up! Sticker Activity Book is a publication aimed at the younger audience. The large format book runs to only sixteen pages, the middle two of which consist of stickers which can be used with the book or permanently stuck on a fridge, much to the chagrin of parents. The book is also designed to reward your young cherubs and includes both stars to place on a completed activity as well as special awards. The book consists of a number of different puzzles to solve including, a Campus Crossword, where the clue relates to the names of the girl students. There is a maze, a word search and a secret message to decipher. You get a year book where you must match the description to the appropriate sticker, another where you match a badge of honour to the right girl and another where you must match the sticker with the right description. There is also a montage picture to complete. What is there to say? It’s a sticker book. It's bright, shiny, inexpensive and should keep the kids amused for a couple of hours on a rainy day.